Since musician and composer Peter Bussigel joined the University of Virginia faculty in 2015 as a Jefferson Teaching Resident in Interdisciplinary Arts, he’s been opening student’s ears to the potential of experimental electronic music. Although he is a member of the McIntire Department of Music, Bussigel’s work is interdisciplinary and touches multiple departments across Grounds. His courses often combine sound with video, sculpture and theater. Bussigel is currently co-teaching a yearlong course on art and civic engagement with Katie Schetlick, a lecturer in the drama department. It is one of four new civic and community engagement seminars being offered in the College and Graduate School of Arts & Sciences. 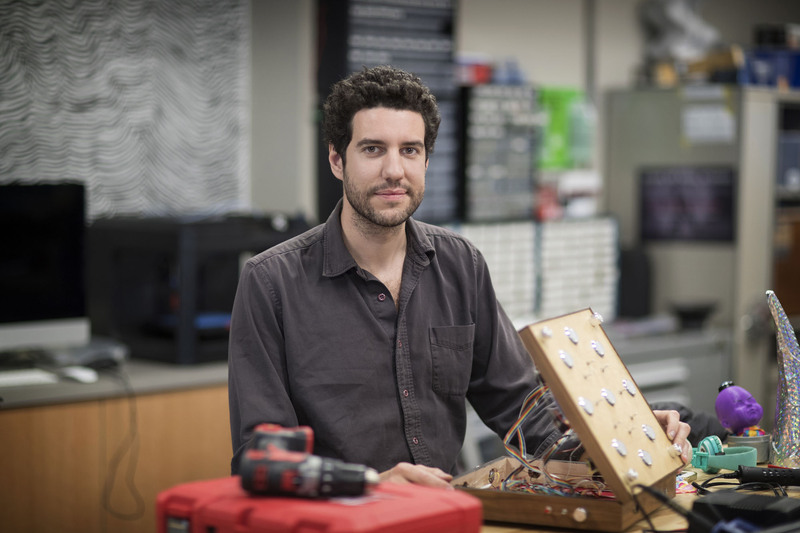 This semester, Bussigel taught a small-group course called “MICE: The Mobile Interactive Computing Ensemble,” which music department chair Matthew Burtner started to bring greater exposure to experimental electronic music performance. Students create electronic instruments and controllers to make music. “The goal in most of my classes is to make something, be it sculpture or sound or performance. But I’m also interested in exploring technical tools in a practical, experiential way,” Bussigel said. The music his students make is anything but traditional. “I think it’s a good thing to question expectations and to push against the values that you take for granted. So with electronic music and with these kinds of really rudimentary synthesizers, I ask students to engage sound with an open mind and find unexpected musical places that are personally exciting,” he said. Bussigel said there is a tendency in some forms of popular music to lull people into a state of complacency, and he hopes to challenge that. “Confronting something that is difficult, I think, is often really motivating and inspiring,” he said. Take a look and a listen to what Bussigel and his students are working on in this UVA Today video.